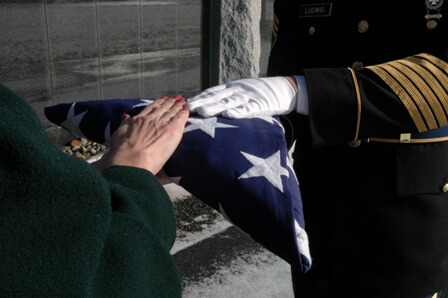 A United States flag is provided, at no cost, to drape the casket of a deceased Veteran who served honorably in the United States Armed Forces. If the Veteran dies at a VA Hospital, they will provide the flag. If the Veteran does NOT die at a VA Hospital, you will need to provide us with a copy of the DD-214. We will then complete the application for procuring the Flag, and have the next-of-kin sign it. The law only allows one burial flag per Veteran. We cannot replace it if it is lost, destroyed, or stolen. Most of the National Cemeteries display an Avenue of Flags on patriotic holidays and during special events. These burial flags have been donated by the families of deceased Veterans and provide a unique visible tribute to all our Nation's Veterans. A Certificate of Appreciation is presented to the donor for providing their loved ones' burial flag to a national cemetery. Please contact the cemetery of your choice for information on how to donate a Veteran's burial flag.